Tubetech is a dynamic and forward thinking company specializing in high and low pressure piping systems. 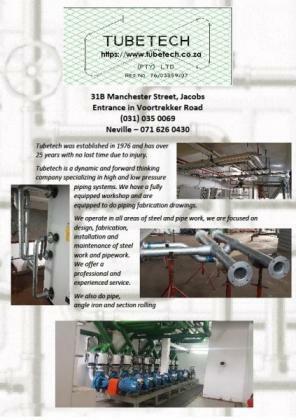 We have a fully equipped workshop and are equipped to do piping fabrication drawings. We operate in all areas of steel and pipe work, we are focused on design, fabrication, installation and maintenance of steel work and pipework. We offer a professional and experienced service.